Victory Golf Pass :: Save Money Every Time You Play Golf! 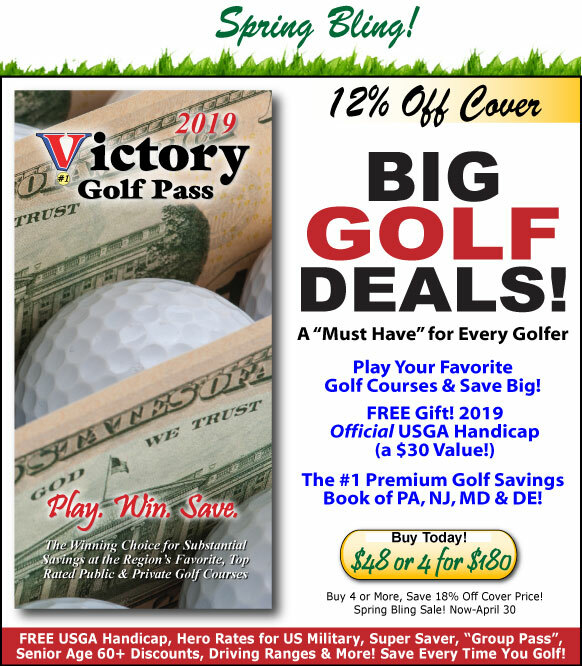 The 2019 Victory Golf Pass Book offers Substantial Golf Green Fee Discounts and Additional Golf Savings to 337 Favorite, Top Rated Public & Private Golf Courses & Driving Ranges of Pennsylvania, New Jersey, Delaware, Maryland, Virginia & West Virginia. Bonus Gift! Get a FREE Official USGA Handicap (a $30 Value!) for the 2019 Golf Season as our Gift to You! #1 Premium Golf Savings Book in PA, NJ, MD & DE! The 2019 Victory Golf Pass Book features Substantial Savings and Green Fee Discounts to Top Rated, Award Winning, Nationally Recognized, and Local Favorite Public & Private Golf Courses, Driving Ranges, Executive Golf Courses, and Par 3 Golf Courses of Pennsylvania, New Jersey, Delaware, and Maryland, plus Bonus Courses in Virginia and West Virginia. 337 Public Golf Courses, Private Golf Courses, Driving Ranges, Par 3 Courses, Executive Courses, Mini Golf & More. Plus! We've added 30 New Courses & Ranges this Year! The 2019 Victory Golf Pass book is designed to be super easy to read and use. Take your book to the Pro Shop, have attendant check off the Deal used in the Book. It's that easy. With Victory in your Golf Bag - you'll always be ready to play, save & win at your favorite public and private golf courses! Like a Premium Bound Golf Guidebook, each Participating Course Deal includes pertinent information such as Website, Phone, Address, Ratings & More. Save Money Every Time You Play Golf. Victory is the "Winning Choice" for Golfers! Save money and play where you want, when you want. No last minute hassles looking for a great deal. The best deals are all in the 2019 Victory Golf Pass book! CART is included in the Player's Fees - No surprises at the Pro Shop! Know what your paying before you play. Exclusive! FREE Official USGA Handicap for 2019! As our FREE Gift to You - Get a Bonus Official USGA Handicap for the 2019 Season. This optional bonus offer has a $30 retail value and is an amazing value-added extra! A "Must Have" for Every Golfer! Our Biggest Deals! FREE Greens Fees & Substantial Savings at 78 Courses. Great extra savings just for Golfers Age 60+. Click Link to view all 129 Courses/Deals. Attention Groups of 6 or More Players! Get Extra Per Player Savings at 73 Victory "Group Pass" Participating Courses. Click link for full details. Mark your calendars for our Exclusive Victory Days! Get Private Course access, Bonus Savings & Extras, plus "Spring" and "Fall" Victory Golf Outings - all on these special days exclusively for Victory Golf Pass Members! See the Victory Golf Pass Participating Courses getting Junior Golfers in the game with great specials like FREE Golf. Plus, Kids will love the Mini Golf Deals, Par 3 Courses, Golf Simulators, FootGolf & More! Practice makes perfect. There are 55 Golf Courses & Driving Ranges offering Special Discounts like Buy 1 Bucket, Get 1 FREE & More! Play More, Get Rewarded! Some Courses are offering Customer Loyalty FREE Greens Fees & More! Get the gear you want & save in the Pro Shop with coupons at these 73 Courses! Save on vacation with the Victory Golf Pass book in your golf bag - we've got great courses & Deals at the Jersey Shore, Delaware and Maryland Beaches & More! All participating golf courses are within a comfortable driving distance for golfers living in the Philadelphia Metropolitan Area, Delaware Valley, and Mid Atlantic Region. Victory is the ONLY Golf Savings Book endorsed by the PGO (Pennsylvania Golf Course Owner's Association, and the DSGA (the Delaware State Golf Association)! Victory is produced by a PGA Professional and Golf Course owner who is dedicated to providing the BEST Golf Value for Golfers! Junior Golf Leader - Fun For the Whole Family! Looking to the next generation of golfers ~ Victory is proud to lead in offering JUNIORS access to the best courses in the area! Plus get lots of Family Fun discounts at Driving Ranges, Par 3's, Pitch & Putt, and Mini Golf Courses - even Golf Simulators, FootGolf, Disc Golf and Go Kart Deals! Special Golf Stay & Play Offers at Conley Resort & Golf. The Victory Golf Pass donates a portion of proceeds to worthy charities including the Crohn's & Colitis Foundation of America through our Victory Hope Foundation. Click Here to learn more about our charitable giving. Play Your Favorite Golf Courses ~ Save Money Every Time You Play Golf! Play. Win. Save. Victory Golf Pass is the "Winning Choice" for Every Golfer.